I found a very small tick bite on my right leg. I believe it was sucking the blood out of me for a good twelve hours. I took the tick off but not sure if I got the head. The bite spot is a sore, really red and irritated skin. I don't know what to do to keep an eye out for Lyme disease. I have been bitten several times by ticks while walking our dogs. I have taken them off immediately, because I can always feel them trying to attach to my skin. Whatever toxin they use to try to dig into the skin totally irritates me. It gets extremely itchy at times, other times the bites feel like they are going away, and then all of a sudden they begin to itch all over again. Sometimes they feel flat other times the area is raised. Why does no one have an answer to why this happens after tick bites! Why do they itch for several months! I was bitten by a tick on the top of my shoulder and when it was removed I began feeling dizzy and extremely itchy all over but around my glands in particular. After 10 minutes I had a rash all over my body and was turning bright red in the face, had trouble breathing and my neck was swollen. I was escorted to a chemist by an ambulance and bought some Phenergan (antihistamine) and the symptoms were gone in about 20 minutes. Now I have a large painful lump on my shoulder. I believe it was an adult female paralysis tick (Ixodes holocyclus) which are native to Australia. I visited Cape Lookout Island off the shore of North Carolina in May only to find the presence that evening of a tick attached to my outer upper thigh which I pulled off with my finger nail. I destroyed it by crushing it. Later I found a second tick on my clothing. That was also destroyed as well followed by a further search. No more were found. I developed a lump at the attachment site and two other spots on inner leg. All were red and itched. I am concerned if I have anything to be concerned about. Lump size is 3/16 in. Seven months back I got bitten by deer ticks from jungle. The symptoms are light brown dotted spots in forehand and some part of the body and lower abdomen, I got treated by a skin doctor and had antibiotics, but it remains unchanged. It rarely itches. I had a tick on me today and when I got it off it had a little spot of blood where it bit me. About 1989 or 1990, I was bitten by a tick while cutting grass. I removed it myself. It did leave the red bull's eye. Since I worked in healthcare I had the emergency room (ER) doctor take a look. He said it looked like a tick bite the kind that produces Lyme's disease. 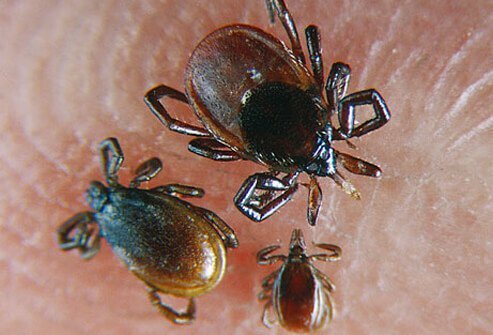 Lyme's disease was fairly new at the time and since our county (we contacted Health Department and Department of Natural Resources) insisted there were no such ticks in the area and testing was rarely done I went untreated. I developed a horrific headache, achy, feverish, fatigue and 'the worst flu like symptoms ever'. I developed a secondary infection and was put on antibiotics. I had a tick bite about 3 weeks ago. I have been experiencing vague symptoms (fatigue, leg and back pain) for a couple weeks. Yesterday, I developed flu-like symptoms, severe lower back pain, chest pain, fever, neck pain and stiffness, muscle pain, vomiting, and fatigue. I could hardly walk to the emergency room. The doctor prescribed doxycycline. Next day, symptoms still persisted, along with a severe headache. Fever finally broke that afternoon. I was drenched in sweat. This is second day of taking doxycycline, I have no fever but still have headache and body aches and pains. I was hiking in the mountains, areas of sagebrush, on Monday, and I developed a migraine type of visual interruption on Thursday, followed by headache on Friday and Saturday. I felt chilled and after showering, discovered tick on underwear line. The tick came out easily after the hot shower and was not full of blood, headache ceased rapidly, possibly left some nasal congestion. I had a tick enter my body below the neck, the next day I developed extreme pain across the shoulders, and then it went to my chest I could hardly breathe. I went to the hospital and had a massive dose of morphine which helped the doctor put me on colchicine which is a gout medication. I was told it delivered a big dose of anti-inflammatory. It was okay for a few weeks but the same excruciating pain came back, again as first diagnosed. I am now on 4 different pills. I was not aware of the bite and had no bull's eye. But I had an abrupt, excruciating headache for about 24 hours, aches and fever, I thought it was the flu. The other large symptom has been profound fatigue. I was sleeping constantly. When I went in flu test was negative, and the doctor put me right on medications. I have been bitten by a tick for the second time. I received one dose of doxycycline because this occurred within a 36 hour period, however, I have been very fatigued the past week. I found a tick on leg and removed it but there is a welt and a big lump and it itches like crazy. 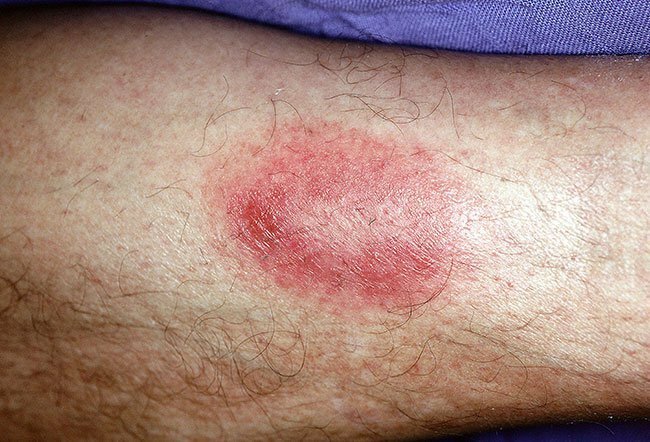 For the past several summers my husband and I would get bites - red, firm, itchy spots that would last for more than a week. We thought they might be flea bites but having worked for a veterinarian I observed that bites I knew were from fleas healed quickly. Today I caught the culprit in the act of biting me! It was so tiny I took out my magnifier and watched it then looked it up: a tick larvae, but I couldn't tell what species. I had a tick bite on my leg. I let my boyfriend remove it . He pulled and pulled, and when the tick let go, it had some of my skin. I knew he was doing it wrong, but it was too late. After removal, I had itching, scaly skin. When I itched, it my skin broke open. I had scabs. I went to doctor and he prescribed cream with hydrocortisone and steroids. The bite healed after using the cream, but it left a brownish discoloration around the tick bite area. When I stopped using the cream because I thought it got better, it reappeared again in a couple of months. I can't get rid of it. A few days ago I removed a tick from my leg in the ankle area. Yesterday morning I noticed a bullseye around the area. It burns and it's itchy. I've been so tired and I vomited. My leg looks like the picture in the article. I found a tick on my scalp last night and woke up with a terrible headache and vomiting. I'm wondering if this related to the tick.